I love wild boar ham! It has a salty flavor just like domestic ham, but it also gives off a slight scent of eucalyptus. The meat is a beautiful deep pink, almost on the verge of red. 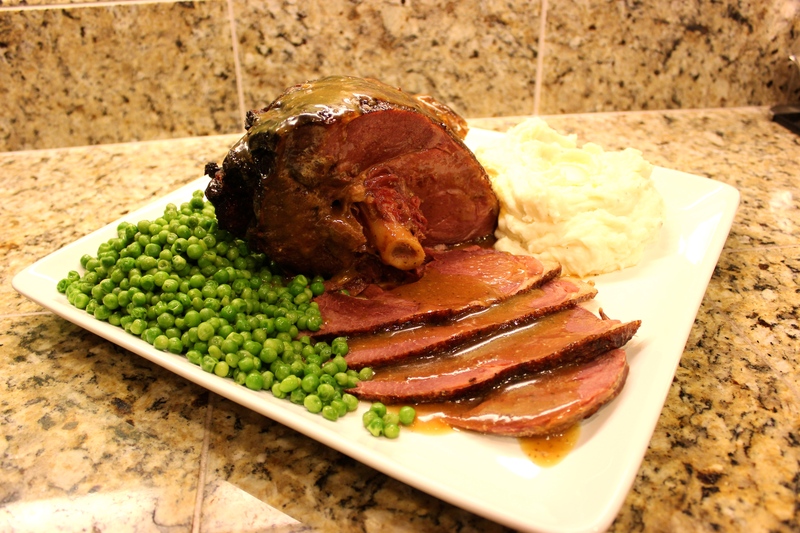 I served it simply, with a side of peas and mashed potatoes, because a ham like this needs humble sides so it can take center stage! I actually wasn’t sure about baking this ham. I had come across it in the very back of an extra freezer in the garage. It had been in there for about two years, and even though it was vacuum sealed, it had a touch of freezer burn on a spot at the bottom. But I figured I had nothing to lose if I baked it, and I am so glad I did!! It was perfect. I placed it in a roaster and added some garlic powder, onion powder, celery seed, black pepper, dried parsley, a chopped onion and some chicken broth. 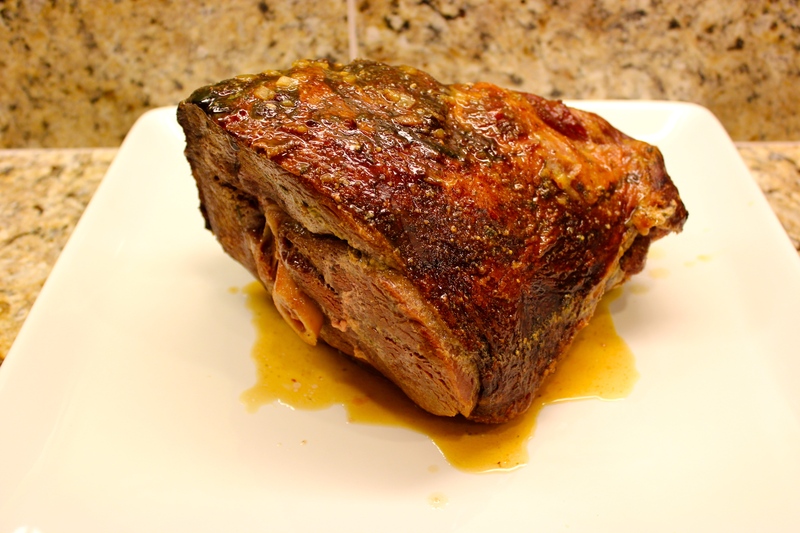 I basted it every 15 minutes as it roasted in a 350 degree oven for about 2 hours. 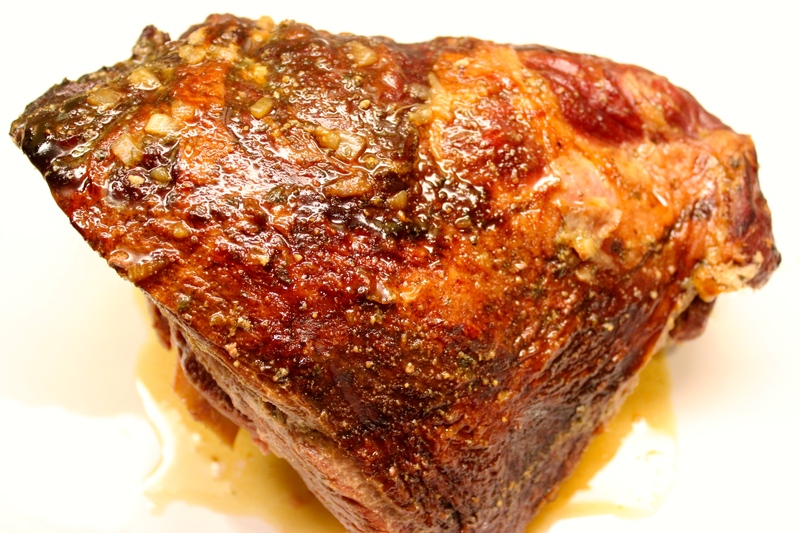 By basting the ham, it created this beautiful caramelized exterior. I made a simple gravy by whisking into the drippings, a roux from equal amounts of butter and corn starch. It created a yummy gravy for mashed potatoes. With my side dishes ready, this makes the perfect Sunday evening dinner, Easter ham, or anytime. Check back to see what I make with the leftovers! Pot pie? Ham and potato soup?